There's a lot of funny labels on products in China. Sometimes it's a cultural thing but often it's just because of bad English. You see, China is very keen on learning English and using English. All the students study it at all levels of school. English has been trendy for decades now, since it is known to be the international language of business, science, and so on. 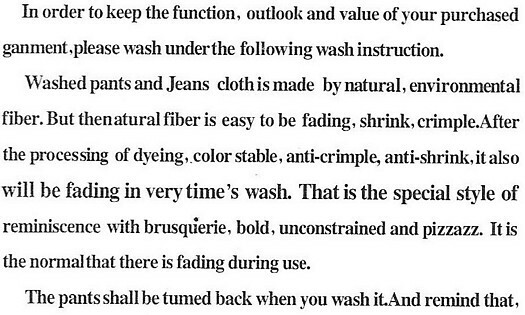 I have other pages showing funny English on signs, but on this page I thought I'd show some of the strangely worded English commonly seen in China on labels and clothing. 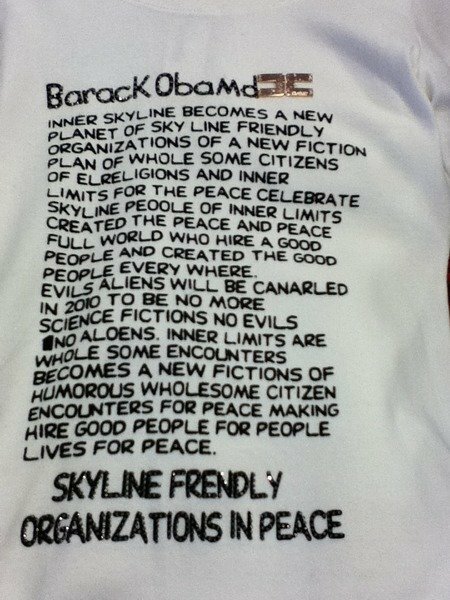 Don't you feel much safer now that you know "Evils aliens will be canarled"? 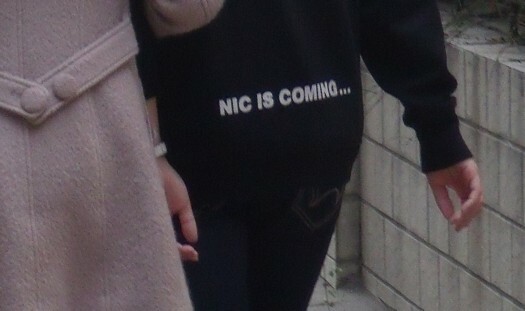 In the photo above you see one of the more strangely named brands of clothing in China: "Nic is Coming". Li Chen, a host on China's version of MTV, started this line fairly recently. I've never heard an explanation of the choice of name, but it seems strange to see it plastered across a young women's behind. On the other hand, I've also seen a slim young woman wearing pants with "BUFFALO" in big capital letters across the rear, and another reasonably friendly looking young woman wearing a shirt that said "ANGRY PIG" on the front. Another one had a green shirt that boldly proclaimed "THINK GREED" (yes, with a "D"). Quality rejects from the export companies still have a good market in China. There are funny labels on all sorts of products in China. As you can see here, this one is for a plastic garbage can. It's hard enough to believe that the can is "folksey" (aw shucks... we all spell it with an extra "e" around here) but protection against a cyclone? Can't you just picture it? "Look! A hurricane! 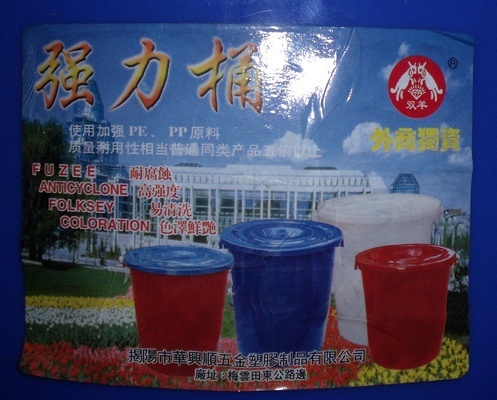 Into the coloration plastic cans everyone! You'll be safe there!" I'm actually using this stuff, 'cause I'm a Man. It smells like I'm putting varsol on my lips but it seems to do a good job at preventing chapping. As you can see from the magnified view of the label below, it claims a lot more... if you can actually figure out what it's claiming. Is it promising "nothing of quality"? Is it actually desirable that my "cherry lips reply the bright pool"? In 2009, my wife and I stayed a day or two at a Hutong Inn in Beijing. Skin lotion and hair conditioner was supplied with the room. This is the skin lotion. I'm sure many of the guests are wildly enthusiastic about slathering "Oily Honey" onto themselves. One is sticky; the other slimy. Doesn't it make sense that together they'd be ideal for skin? Anyway, the really interesting part is the English on the label, shown magnified below. Apparently, one of the selling points is the fact that you can apply this with your skin in place - you do not need to raise your skin to the lotion; you can take the lotion to the skin! What an innovation! Or maybe I'm parsing that wrongly. Perhaps the "raise" part goes with what is after "The" -- so it means your skin will be raised to such a level of health that you will not need "epidemic disease ability". I'm not sure what a "ream muscle" is. 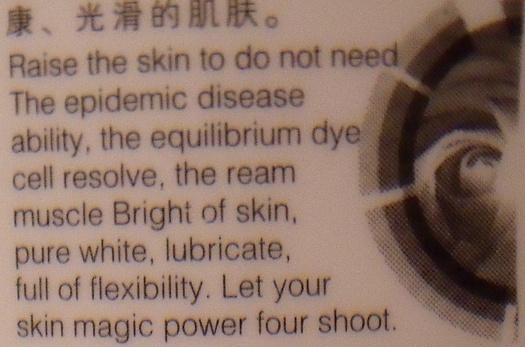 But, of course, everybody wants to "let your skin magic power four shoot". How else would you power four shoot? How do companies get such bad English funny labels? My guess is that they just used some online translation and didn't have the English level to check whether or not it made any sense. Gives you a lot of confidence in computer language translation, don't it? 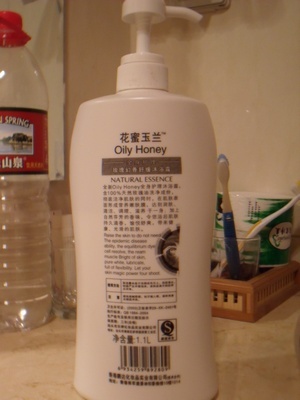 The Hutong Inn bathroom was also supplied with hair conditioner. Here, at least the adjectives make sense in the context of hair. 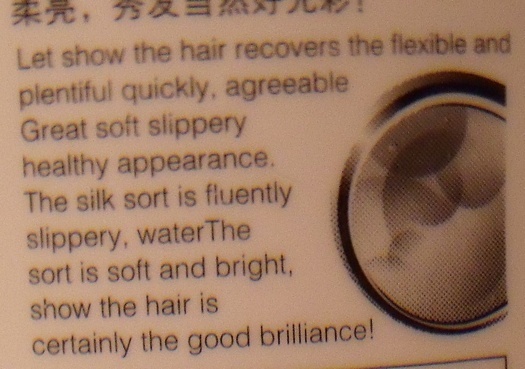 Who would not want a "great soft slippery healthy appearance"? But what's with the "fluently slippery"? That sounds like a description of a used car salesman. 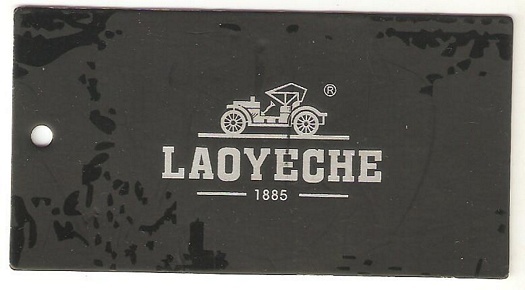 Recently, needing a pair of black jeans or something similar, I went to a store that sold all men's clothing of the "LADY ECHO" brand. At least that's what I thought it said. On closer inspection I realized the O was an E, so it was "LADY ECHE"? In the Chinese language, any syllable has multiple meanings. There can be dozens of possible meanings. Knowing the tone narrows down the list but we don't have that here. Even if we know the intended tone, we need to look at the context of the syllable to choose the meaning. As you can guess, puns aren't as funny in Chinese because ambiguity is the norm. On this funny label we don't have the tones but have the picture and date for context. CHE means vehicle (car, train, wagon, etc.). YE probably refers to "yeye", which means grandfather. LAO means old/respected. As near as I can figure, my new pants are "respected old grandfather car" brand. There's a catchy brand name! 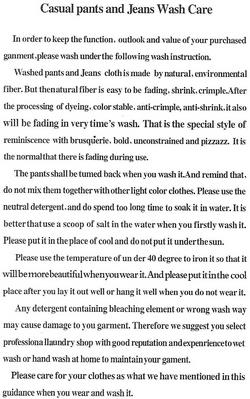 With the pants came washing instructions, which don't exactly belong in a funny labels collection but let it go, eh? To the left, you see the complete tag. Below is a close-up photo of the most interesting English on it. The "anti-crimple" feature and the "style of reminiscence with brusquerie and pizzazz" just make me want to rush out and buy another pair! I should "remind that". 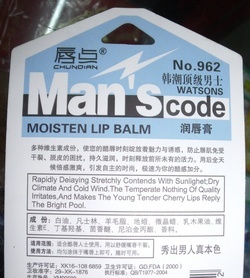 Even before computer translation, there were lots of funny labels on products in China. In the early 1990s I found some underarm deodorant (quite rare in those days!) that promised young men who used it would marry a lovely girl. And you could buy toothpaste that features "SOD"! Shopping in China had and still has some unexpectedly amusing aspects to it, like funny labels. Return from Funny Labels to Chinese Things overview page.